Where to spend our last morning in Milan now that seeing The Last Supper was off the table (so to speak)? We took the convenient subway to the Basilica of St. Ambrose. Churches have been on this site since the 4th century. The current Romanesque structure dates from 1080. 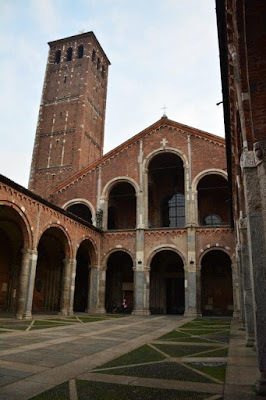 Ambrose is the Patron Saint of Milan and was one of the most important ecclesiastical figures of the 4th century. He is one of the four original Doctors of the Church (along with Jerome, Augustine and Gregory the Great). 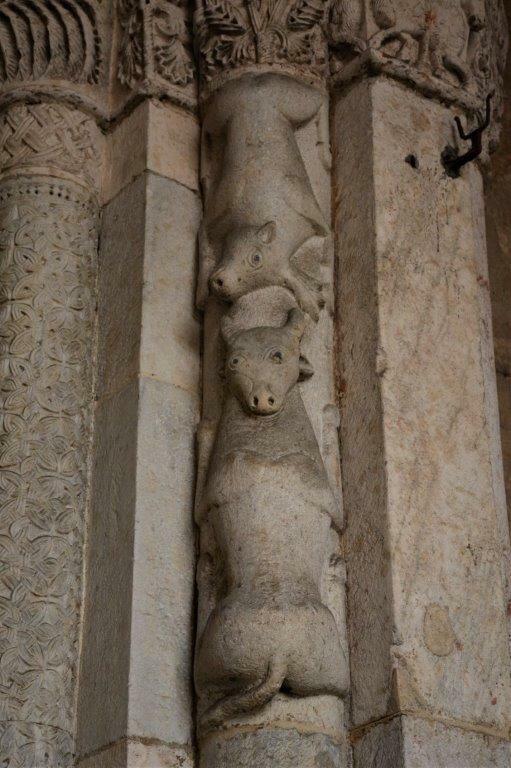 The arcade in front of the church has many additions inserted into the walls and columns that were not original to the church. They appear to have been taken from elsewhere…one column was actually inserted upside down. The area was an ancient market place and there are plant and animal carvings that seem to pre-date even the Romanesque period of the building. The sarcophagus on the left has been in that exact spot since the fourth century. It is said that Ambrose himself might have been there when it was created. 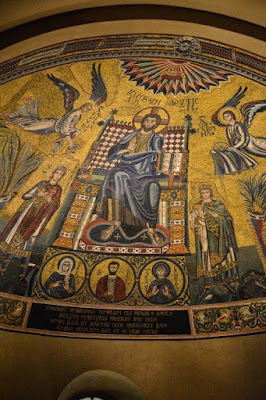 Behind the 9th century golden altar is the apse with a 13th century mosaic depicting Christ, the Saints Gervasius and Protasius and scenes from the life of Ambrose. 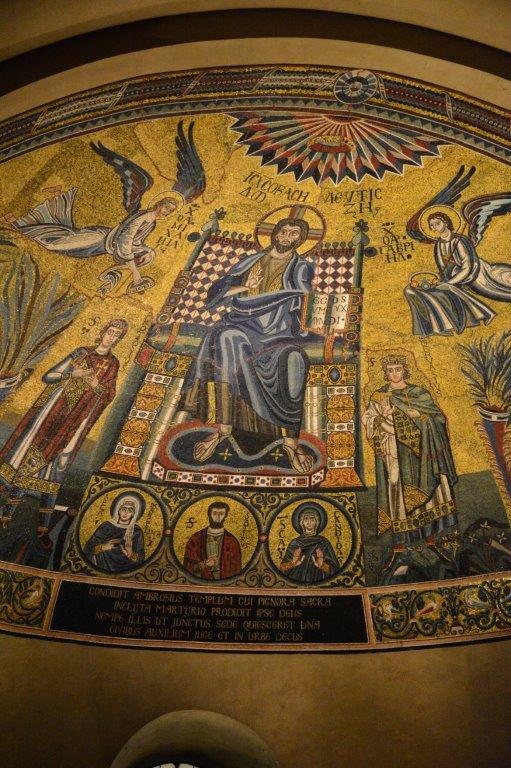 The mosaic was restored after being damaged by World War II bombing. 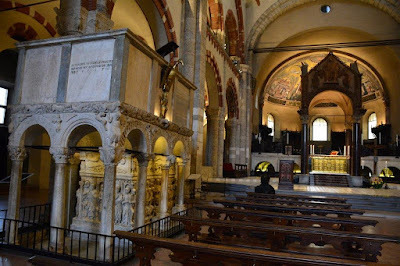 St. Ambrose died of natural causes in 397 and is displayed in a crypt beneath the altar. 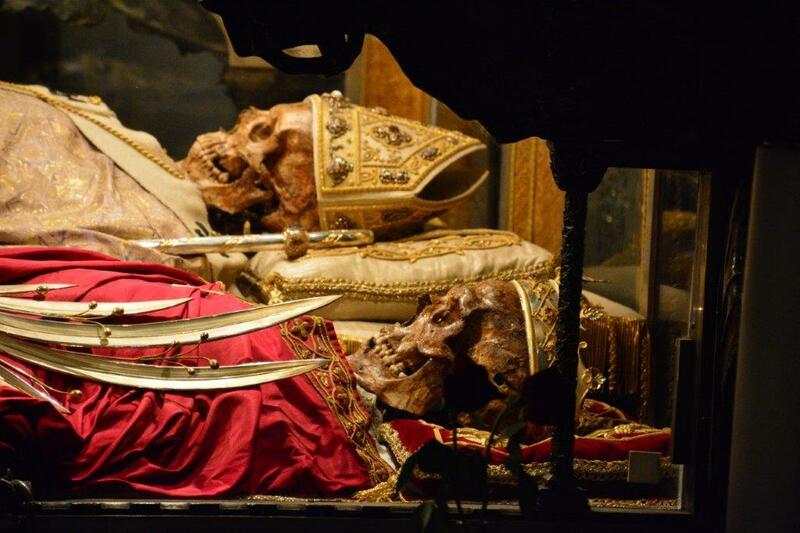 He wanted to be buried alongside Saints Gervasius and Protasius, two 2nd century Roman soldiers who were beheaded for swearing allegiance to the Christian God instead of the Roman emperor. With all due respect, the Catholic veneration of the mortal remains and pieces-parts of their favorite sons and daughters can get a bit creepy. But that’s me. From here we returned to the hotel, finished packing and took the last Metro pass subway ride to Central Station. The bus to the airport passed a blazing fire that consumed a van on the side of the expressway…my camera was packed away so there is no documentation of that little entertainment.